Innovation, successful operations, amazing feats of coordination are not discussed. Basically the war is not discussed as a war. The anti-war movement is discussed in detail. One plus, are the interviews with the NVA members, those are interesting. If I've read 100 memoirs of the war, they focus on trying to do the job assigned ... and so far, I have seen none of those sorts of stories in the movie and in my book they are more a part of the war than the anti-war movement and stories about storming the pentagon etc.. Yes, as I expected, the progressive view ... don't out right lie, just ignore anything counter to your view. The Volume XLIII issue 4 is all Vietnam, only read Taylor's article, don't know whether the others are pro or con. I'd posted it at viewtopic.php?p=318862#p318862 a thread about the above article. Sorry the CDs weren't what you wished for. I'm amazed at how the trend has changed from black folk being part of American culture, to something moving in the other direction ... during my life time ... Chappie James was DCO of 8 TFW during operation bolo ... together ... "Blackman and Robin" ... lead the wing on 2 different missions which shut down the PVAN M-21s ... Chappie went on to become the head of NORAD in the mid-70s. Can't quite make out the unit patch, but it looks like 'The Electric Strawberry', 25th ID. Henderson, Charles. "Marines Sniper - 93 Confirmed Kills." Berkley Books, New York, 1986. I will do something of a book review on this book, which I'd read, re-read 3 times this year. The book is the story of Carlos Hathcock, who served 2 tours in Vietnam as a Marine Scout Sniper and survived, just barely. Unlike a normal book review, I will drill into the four most interesting missions Hathcock was involved in, during his first tour. Carlos Hathcock and John Burke, who were usually paired together as sniper and observer, were normally based on Hill 55, south west of Da Nang (formerly known as Tourane) along the Ca De Song (river). The Elephant Valley (so called as some elephants carrying supplies had been killed there earlier in the conflict) was to the NW of Hill 55 and also being along the river, was part of the main infiltration route for men and supplies into the coastal areas around Da Nang. The Scout Snipers based on Hill 55 operated off Hill 55 as well as all around the area. Apparently Hathcock had convinced his boss Captain Edward Land, that "good hunting" would be possible farther North, due to the more open terrain (1,000 meters versus 600 meters fields of fire). So the mission was on. The mission was planned for 4 days and Hathcock and Burke equipped themselves accordingly. Hathcock's normal rifle at this point was a Winchester Model 70, chambered in 30.06 with an unertl 8x scope on top. The unertl was different from modern scopes in that when the rifle recoiled, the scope slide forward in the mounts, to mitigate recoil effects on the interior mechanicals of the scope. The shooter, then had to pull back on the scope to reset it for each shot. Note the fluting in the barrel. This increased heat dissipation and reduced harmonic vibration as well. 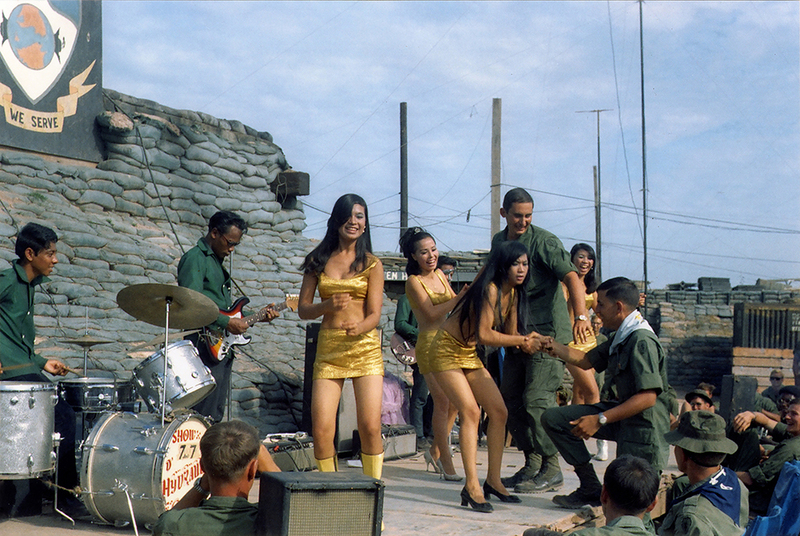 The Marines knew what they were doing back in those days. Hathcock and Burke ate nothing but peanut butter, cheese and crackers when they were on their missions at this point. I presume they had EVERYONE near them hand over these components of the C-Rations, so they could build up a stockpile. Burke, carried an M-14. I'm not sure what sights he had on there, possibly a Redfield 3-9x scope, certainly those were used later, but he might have just had irons at this point. They also carried an M49 20x spotting scope and each had an M1911 sidearm. A days worth of water in canteens (you can't carry 4 days of water, so they had to replenish water). Maps, log books. They did not smoke or use bug spray when on missions, so they had to grin and bear it. They believed the enemy could smell the odors. So, for Elephant valley, they moved into the area and setup on a low hill with field of fire to the NW, NW and NE and waited. Out in front of them was about a 3/4 mile by 3/4 mile area of rice patties and dykes. After a few hours a large contingent of enemy soldiers appeared. They were moving across the dikes (later learned they were a newly arrived rifle company attempting to locate and join a decimated battalion). Hathcock and Burke identified officers at the front and rear of the formation and their first shots, took out these two. Hathcock's second shot took out a third person holding a pistol. Leaderless, the company sized unit (later estimated to be between 150-200 men) went to ground behind the dikes. Whenever they popped their heads up for a look, Hathcock or Burke would shoot and sometimes blow a head off. Hathcock had arranged for artillery support to fire illumination rounds, at night and when the darkness came, Burke called in the Illums. Sure enough, the NVA were moving, but Hathcock and Burke were able to take more of them out and send them back behind the dikes again. This went on all night. And in fact, this pattern repeated itself for the next 2 days as well. Everytime the NVA attempted to move, Hathcock and Burke would take some of them out and send the rest back behind the dykes. On the morning of the fourth day, Hathcock and Burke, had to prepare to move out. A "sweep" platoon of Marines was lined up to come in to the area and engage the rest of the pinned NVA company. But before they left, H&B setup an artillery ambush. When the NVA started to move in the morning, H&B switched their fire, from the leading personnel to the rear personnel, allowing the leading personnel to continue to run to the edge of the field where some hooches were. H&B had laid on a HE barrage for those hooches. They called in the fire, just as the leading NVA reached the hooches and then H&B departed the area and joined up with their egress Patrol to head back to Hill 55. I saw no "final body count" ... but just the idea that two guys and some illumination rounds could pin down and decimate a rifle company for 4 days, seems so improbable, that I find this to be the most interesting mission in the book. I'm sure one of the later ones was personally more challenging for Hathcock, but I find Elephant Valley to be the most improbable. This was a name given to a VC lady who led a sniper platoon around Hill 55. She was notorious for torturing and killing Marines captured in the area. I will not go into the details. Land and Hathcock laid a trap. Again, an artillery ambush was planned. A group of VC was spotted moving down a hill. One of them squatted, confirming female taking a piss. Land called in the artillery, killing four of the 7. Apache panicked and ran down the hill towards Hathcock and Land. Once she paused, Hathcock shot her. She fell and he shot her again to make sure. There was a lot of happiness on Hill 55 after that and Hathcock's popularity soared. As the Marine snipers on Hill 55 increased their effectiveness, the enemy took note and took countermeasures. A trained sniper platoon from the North was moved in to the area. Marines started dropping. In was determined that fire often came from a particular hill, but searches of the hill came up empty. The shots coming from this hill were attributed to "Cobra". It did turn out that Hathcock and Burke were able to exploit the pattern of shooting from that hill. They went out and approached the hill from a stream that ran beside it. This offered a concealed approach due to the vegetation along the stream bank. Upon reaching the hill, they noted a concealed area that was like a "slide". The sniper would apparently leave the hill after taking a shot, by sliding down this shallow gulley and into the stream. H&B continued downstream checking the banks until they found broke grass/ground indicating something had exited the stream. They followed this trail up a hill. Hathcock got suspicious due to the obviousness of the trail. So, H&B went off this trail and circled around in a wide arc. The enemy sniper was waiting, saw them and fired at Burke, hitting him in the canteen. The stalking and counter-stalking continued for several more hours. Eventually H&B both saw a "glint" in the sun. Hathcock aimed at the glint and fired and killed the enemy sniper by putting a round through his scope. Later H&B decided Hathcock probably won the fight by seconds at most, as he and the enemy would've been looking at each others scopes at the moment Hathcock fired his fatal shot. A few weeks before Hathcock left Vietnam at the end of his first tour, he was asked to volunteer for a risky mission, but given no other information. Hathcock says he volunteered because he knew if he didn't, they would pick another less experience sniper who would be less likely to survive. Once he volunteered, he was given the details of the mission. Stalk within firing distance of an NVA division HQ, shoot the commanding general and return to base. There were apprently detailed aerial photos, so he was able to spot some irregularities in the ground around the HQ and plan his approach, firing position and withdrawal accordingly. He reached the area at nightfall and began crawling. He low crawled for 70 odd hours, inches per minute. Enemy patrols passed near him day and night but never spotted him. At one point he came eyeball to eyeball with a bamboo viper snake which had it bitten him would've killed him quickly. After staring each other down for a short time, the snake moved off. Hathcock resumed crawling. He finally reached his firing position at dawn of the 4th day and setup in a depression in the ground. The general appeared with an aide and walked towards his vehicle for his daily inspections. He paused and Carlos fired one shot from 700yds killing him. Carlos continued to follow his plan and egressed along a gulley. He survived and made it back to base and then flew home to the USA at the end of his tour. 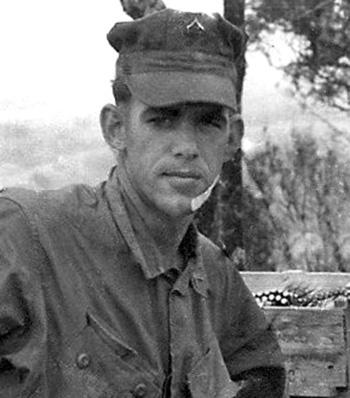 John Burke was killed less than 3 months later, fighting at Ke Sanh. One complaint I've seen is people saying Hathcock's stories are only attested to by Hathcock himself (who died in 1999). Surely the Marines have records that could corroborate Hathcock's stories. Henderson's book is not written in the footnoted style of a work of history. I will try to find other works or corroborating information. I think only Marine or NVA records could be used. I found this on Johnny Burke. His face reflects more than the 23 years he was alive on this earth.